Shark NV680UKT (true pet version) is currently on sale for £139.99, a good £40 saving from the normal Amazon price. The three camels have the current price as the lowest it has ever been! Featuring the patented Shark Powered Lift-Away. This means the pod can be detatched but the brush in the head continues to rotate, so now you can reach right under the trickiest furniture for carpet cleaning in Lift-Away mode where traditional uprights may struggle. Featuring anti-allergen complete seal technology that captures and holds over 99.9% of dust and allergens inside the vacuum not back into the air you breathe. And, it's certified by the British Allergy Foundation. Plus, the Shark NV680UK includes the Shark Dust-Away attachment which picks up large debris and fine dust in one easy step. Shark Brilliant. Based on comments from family & friends who have this, this is a bargain for a descent piece of kit. Apparently better than the Dyson! So I've ordered!!! Cheers and heat! I got the cheaper version from Argos last week and I am blown away by how good shark vacuums are! We vacuum every Sunday and use the Dyson handheld for any crumbs regularly. I got my shark on the Monday, plugged it in and vacuumed just the landing and the vacuum was half full with dust. We couldn't believe how much dust we had in our house! This is a superb deal for a better model. What is the warranty on these? I've commented before on this model which I have, it's the best vaccum cleaner I have used and would buy again or recommed. Currys are the best on high st near me . Great price! Heat from me I purchased one too. This one is better on carpets then the newer NV800 model. Lots of reviews on YouTube. What is the value in getting it price matched by Currys? Location? Customer service? Longer warranty? Bought one a couple months ago. Best Vacuum Cleaner around - the pet tool you get in this version is very good. Highly recommended. Quick questions please for the Shark owners. How good is the turbine head? Would it be good for a long time? I must admit I am a faithful Dyson owner (DC20). However, a particular tiny plastic piece keeps on breaking every 1-2 years in the turbine head. We had at least four in the past 10 years. So I am wondering whether it is time for a change, but wanted to check experienced owners first. Thank you. What is the value in getting it price matched by Currys? Location? …What is the value in getting it price matched by Currys? Location? Customer service? Longer warranty? The 5 year warranty is by Shark themselves, you register your vacuum cleaner and they send you a warranty via email, so no change in warranty whether from Amazon or Currys. Same price on Very or £149.99 on Littlewoods with free delivery & 52 weeks interest free to pay. Another converted Shark owner here. Had Dysons for years but this beauty seems to attract dust! First run over carpets you will be amazed at what it drags out. Heated. Showing in stock for me. We're Shark converts too. Lightweight and powerful. Had a replacement after 3 months as the power switch was intermittent, but no quibble warranty. Bought the NV680 on Prime day for £180. Looks like the price has changed. I hoover regular with my Dyson, but it never really gets all the hairs up. Is this hoover better? Will it dig in the carpet and get everything up? Any of the same spotted anywhere else?? I need this but as cheaply as possible! I got the cheaper version from Argos last week and I am blown away by how …I got the cheaper version from Argos last week and I am blown away by how good shark vacuums are!We vacuum every Sunday and use the Dyson handheld for any crumbs regularly.I got my shark on the Monday, plugged it in and vacuumed just the landing and the vacuum was half full with dust. 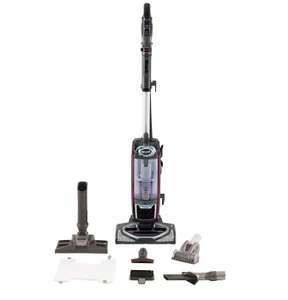 We couldn't believe how much dust we had in our house!This is a superb deal for a better model. Hi. Do you know what the difference between this and the nv340uk is? Not sure which one to go for?!! Based on comments from family & friends who have this, this is a bargain …Based on comments from family & friends who have this, this is a bargain for a descent piece of kit. Apparently better than the Dyson! So I've ordered!!! Cheers and heat! I have had this for last 12 month, amazing piece of kit you won't be disappointed. The nv340uk model seems to be priced higher from other retailers compared to this model. Same price on Very or £149.99 on Littlewoods with free delivery & 52 weeks …Same price on Very or £149.99 on Littlewoods with free delivery & 52 weeks interest free to pay. Thank you , been looking at these for ages , ordered out of Littlewoods , free delivery with 52 weeks interest free !! Any of the same spotted anywhere else?? I need this but as cheaply as …Any of the same spotted anywhere else?? I need this but as cheaply as possible! Deal posting newbie! This is westies7 first deal post. Help out by leaving a posting tip or just to show your appreciation for their contribution.